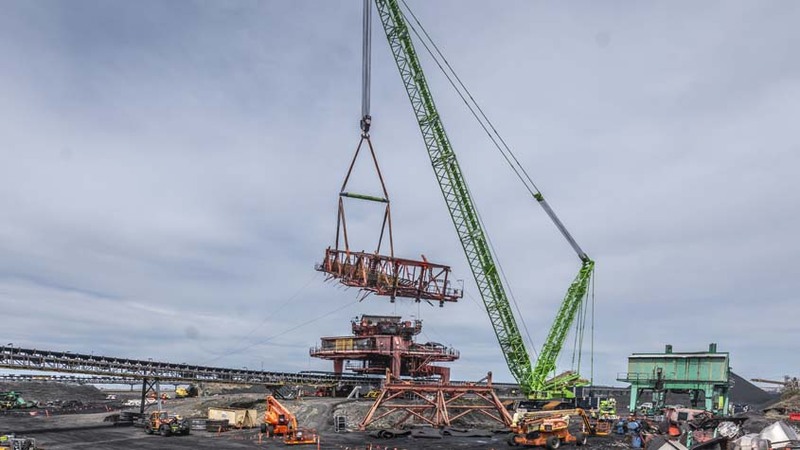 The project involved the demolition of a 1,250 tonne bucket-wheel reclaimer and two 400 tonne stackers. The three coal handling machines had become redundant following the introduction and commissioning of brand new equipment. The three machines were originally straddling live conveyor lines and the site configuration did not permit the relocation of the machines away from the conveyors and to a secluded location. A methodology involving the induced collapse of the structures could consequently not be employed. The first steps of the works were to separate and extract the impact tables from underneath the machines without causing any damage to the live conveyor belts. Hoarding protections were installed over the conveyors for the required lengths, then the machines parked directly atop them. These would provide protection to the live assets from falling objects or hot works by-products inherent to the upcoming demolition works. 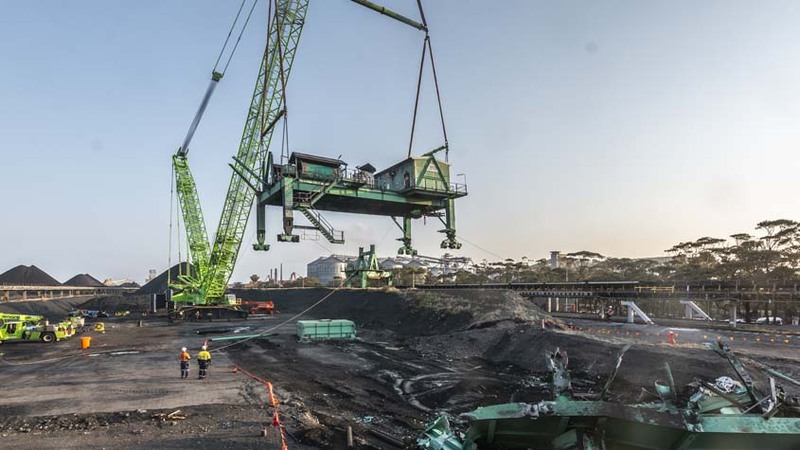 Once disconnected from their electrical power supply and ancillary services, the three machines were progressively dismantled one after another using a 750t crawler crane located within the coal stockyards and directly adjacent to the coal handling machines. 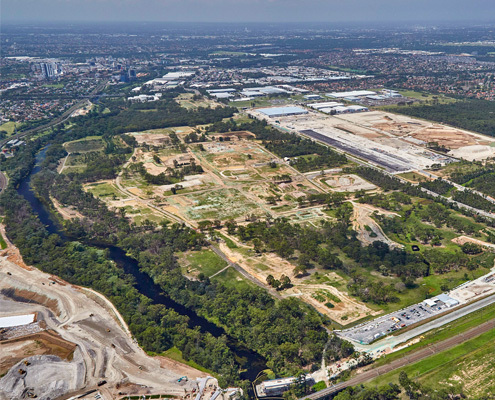 The deconstruction was carried out with minimal impact on the site’s operations. Prior to the deconstruction, engineered lift studies along with structural engineering assessments of the structures were completed. Each machine was then prepared accordingly, which involved the removal of equipment and parts of the structure to reduce the gross weight and adjust the centre of gravity of certain lifts, as well as local strengthening to ensure continued stability throughout the deconstruction process (the structural modifications to the structures were designed by our consultant structural engineer). 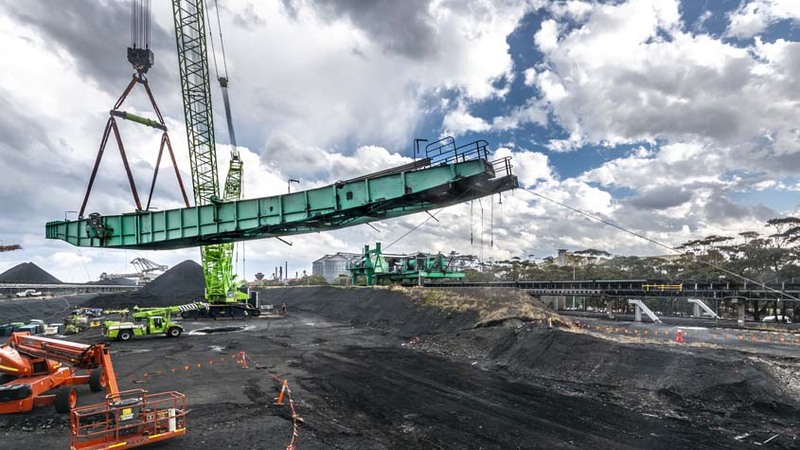 After completion of the lifts, with the heaviest lift at 196 tonnes (reclaimer portal gantry), the sections of the structure were downsized at ground level using a combination of mechanical shearing and oxy-fuel cutting. The processed materials were then removed from site for recycling. The overall project also involved the salvage of a range of items including drive units, electrical cabinets and controllers, electrical transformers etc., which were to be retained by PKCT as spare parts for the machines still in operation within the terminal. The salvage was undertaken before the demolition works were carried out to minimise any damage to the equipment. A significant part of the works described above would have normally required a complete shutdown of key operational assets (coal conveyors, transfer stations, ship loaders etc. ), however the demolition methodologies proposed by Liberty Industrial allowed for all works to be carried out with minimum disruption to PKCT’s operations, keeping the actual shutdowns to minimum occurrences and durations.